← Quatchi Rendered in Snow, Wood! At long last, the Winter Olympics begin tonight! 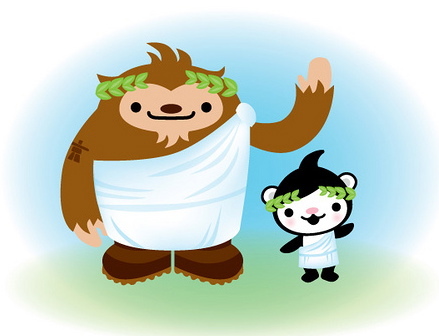 We hope Quatchi and his crew figure prominently in the opening ceremonies. Either way, we’re having some friends over to watch — the fridge is stocked with Molson, Labatts, Moosehead and Kokanee (Quatchi’s favorite!). What will you guys be doing? We’ll also be keeping tabs on Squatchi at today’s protest march… A big day all around! This entry was posted in Uncategorized and tagged Meomi, Miga, protest, Quatchi. Bookmark the permalink. Download the Official Vancouver 2010 Olympic Winter Games app to your iphone or itouch, then open the app, then shake the phone a bit. A surprise shows up, it’s awesome!!! Go Quatchi!!! Quatchie is so awesome.Even your little friend Miga.Miga and Quatchie are the best! Hi everyone sorry for the last comment. Sumi your the last best. But your not that word.